Friends of Westmill Church Charity - (FOWC) was formed on 19th January 2011 at a public meeting in the Village Hall, our primary purpose was to raise funds for the repair and maintenance of the village church of St. Mary the Virgin, Westmill. 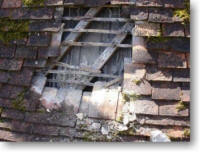 Our first target was to raise substantial funds for the urgent repairs required to the church roof. Over the years both time and weather had taken their toll and after inspection the situation was found to be much worse than anticipated. Suggested costs were anything up to £150,000 or more, so fundraising began in earnest. A target figure of £20,000 was set for the first year – no mean feat for a village of only 269 residents. By the end of 2012, the FOWC had raised nearly £50,000 - an exceptional figure, gratefully received and achieved through sheer determination and hard work, by Committee and Villagers alike. When combined with generous donations from both Grant Trusts and money from the Heritage Lottery Fund (administered by English Heritage) amounting to approx. £100,000, we had raised the necessary funds. 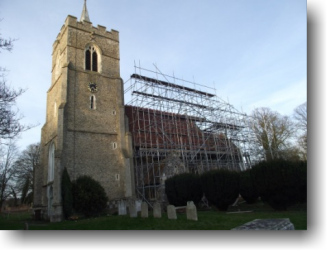 With the church shrouded in scaffolding, work begun in February 2013, progressed more or less without a hitch and the new splendid church roof was unveiled upon completion only four months later in June. Work started on the internal redecoration in November and the majority of it completed in time for our first service on Christmas Eve. It was so nice to be back! Although the major work has now been completed, our church will always be in need of more funds. It is therefore the intention that Friends of Westmill Church will continue fund raising for the upkeep and development of our beautiful church. Thank you for taking the time to visit our website – we plan to keep you updated with news of future activities with dates for events and photographs.